Rene Henery with a fine Central Oregon steelhead. Rene Henery, Science Director for TU’s California Program, has many highlights on his resume. Program Manager with Amazon.com in the company’s start-up years. PhD in Eco-Geography from the University of California at Davis. Part-time Research Professor at the University of Nevada, Reno. Big taimen on the fly in Mongolia. Prominent role in award-winning author Landon Cook’s marvelous treatise on salmon, Upstream: Searching for wild salmon from river to table. You can add this honor to this list: Henery has been appointed to the inaugural Cohort of California’s Water Solutions Network. The Water Solutions Network is dedicated to expanding public understanding of the water management field and bringing the myriad needs and perspectives of water stakeholders to bear on development of new or improved water solutions. The network’s Cohort is a diverse group of experts and thought leaders who will meet and correspond over six sessions of a “leadership and network development experience.” The 24-member Cohort represents multiple sectors and communities across California and a variety of stakeholder interests, including farm bureaus, water districts, environmental advocacy nonprofits, and others. The Cohort met recently for the first time. 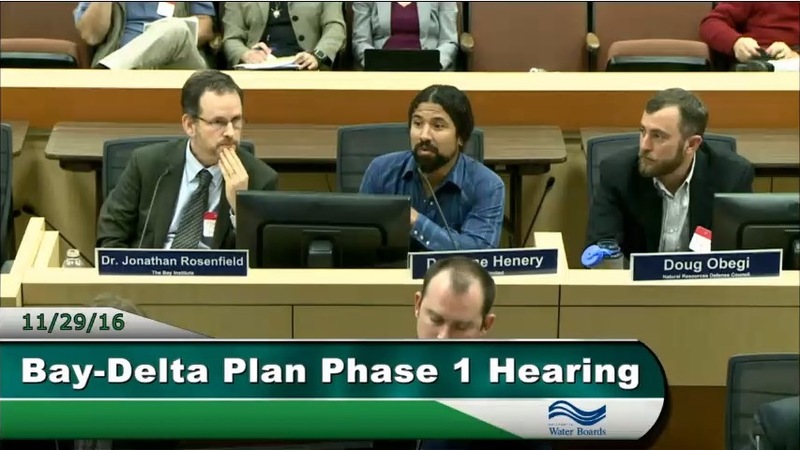 (L) Rene Henery testifying at a hearing of the California State Water Board on the benefits for salmon and steelhead of boosting streamflows at opportune times in the lower Merced, Tuolumne, and Stanislaus rivers. This era of water management—defined largely by aging supply infrastructure, persistent water quality issues, and the effects of a warming climate—calls for collaborative, systems-based approach to ensure an equitable water future for Western states’ economies, ecologies, and communities. Henery and the other members of the Cohort will cross boundaries, connect resources and propose and purse “bold actions” to ensure California’s water future is both sustainable and equitable.